blog.julieandcompany: Knitting is good for your health - and your duct tape prom dress! Knitting is good for your health - and your duct tape prom dress! I have two excellent knitting-related videos for you this morning. The first touts the powerful health benefits of knitting and crocheting, the most impressive of which is a 30-50 percent improvement in memory for the elderly. (This does NOT explain why, as a middle-aged knitter, I still cannot remember where I put my keys, the TV remote, or my cellular phone). 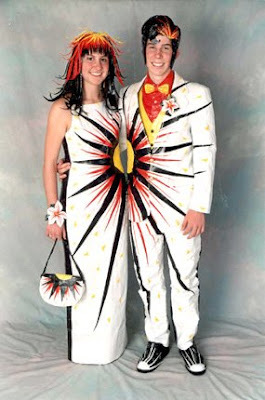 My second video pick of the day comes courtesy of my friend, Ellen who sent me this story of a young couple who used duct tape to make their own dress and suit. You've got to see it; they did a wonderful job. And here's an extra goody for you today: another prom date couple dressed in duct tape. They get an A+ for creativity, but my God, I don't even like wearing polyester because it doesn't breathe. Imagine dancing - and sweating - in that dress!